Gravity tells us why an apple doesn’t go to heaven. In Cecil Hunt, The Best Howlers (1957). From audio on MIT video '1999 Lemelson-MIT Lifetime Achievement Award Winner', on 'Innovative Lives: Stephanie Kwolek and Kevlar, The Wonder Fiber' on the Smithsonian website. 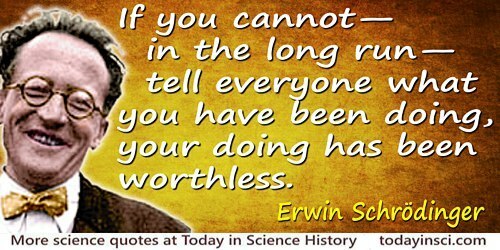 If you cannot—in the long run—tell everyone what you have been doing, your doing has been worthless. Concluding remark of the first of four public lectures for the Dublin Institute for Advanced Studies at University College, Dublin (Feb 1950), 'The Spiritual Bearing of Science on Life', collected in Science and Humanism: Physics in Our Time (1951). Reprinted in 'Nature and the Greeks' and 'Science and Humanism' (1996), 112.
in Programs of the Brain (1978), 143.